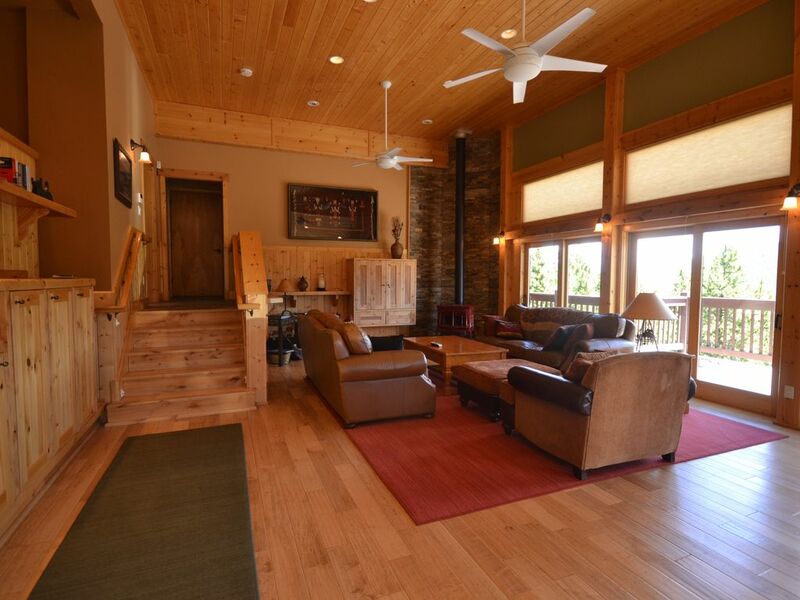 Cobb Vista is a spacious multi-level retreat perched on a hill overlooking the Continental Divide and located just 1.4 miles to the Peak 7 & 8 Base Area of the Breckenridge Ski Resort. With fully stocked kitchen, a private hot tub, and plenty of room for everyone to spread out (14 max). Cobb Vista is the perfect mountain home for a family or group. Large decks and a garden level walk out patio, along with lots of windows allow you to enjoy the gorgeous views of Mt Baldy and the surrounding pine forest. This home has 3 levels allowing everyone in the group to maintain a feeling of privacy with separate bedroom areas and if needed an optional private apartment with full kitchen, bedroom, bathroom and living area can be added for groups 12+. for an additional $125 per night. Furnished with mountain style decor and attention to every detail, Cobb Vista is wonderful mountain lodge with everything you need for a memorable vacation. One mile from the slopes, it’s easy to make fresh tracks in the powder or be in the heart of town in minutes for shopping and/or dinner out. Cobb Vista is nestled on a quiet cul-de-sac in the beautiful Peak 7 neighborhood, with unobstructed views. The Main Level of the home features a large open area with the main living room, wood burning stove, LCD HDTV with DirecTV, vaulted ceilings and is open to the kitchen and dining areas. The main kitchen has two sinks, temp controlled wine cooler, GE Profile stainless steel appliances, granite countertops, slate floor and is fully stocked with all cooking utensils, two coffeemakers, and Calphalon cookware. The dining area seats 10, plus there is an additional table with seating for 4 in the apartment.. There is a Main Floor master bedroom with King size bed, HDTV, full bathroom with jetted tub. The main level also has a private bedroom with twin bunk beds a full bathroom in the hall. A large deck and picture windows line the west side of the main level, with a gas grill, views for miles, and plenty of sun. The top level of the home has a private and secluded luxurious master suite with King size bed, large bathroom with double sinks and Jacuzzi tub, plus an en-suite wet bar with sink, wine cooler, microwave convection oven, coffee maker and toaster, there is a private deck with table, chairs and dramatic views. Downstairs are three bedrooms including a T/V room with three day sofas, two bedrooms each with a queen bed, and a large full bathroom in the hall with double sinks and laundry room with washer/dryer. The two queen bedrooms open up to the walk out deck and hot tub area. OPTIONAL APARTMENT (Available for $125 per night): The home also features a private apartment that offers privacy and separate living area and full kitchen for groups of 12 +. There is a bedroom with a queen bed and full bathroom. The second kitchen is light and bright and also fully stocked with all appliances, oven, refrigerator, dishwasher, microwave and utensils. Adjacent to the kitchen is a living room with a queen pull out sofa, stereo system, and garden level walk out patio. The apartment is accessible through separate entrance or through downstairs hall from the Main House. If guests choose to not rent the apartment it will not be rented to other guests but will be left open for possible owner use. Cobb Vista has a two car garage and parking for 2 more vehicles in the driveway (4 vehicles total). The unique layout of Cobb Vista, with four distinct bedroom and living areas, is perfect for family reunions, wedding parties, extended families or groups of couples seeking their own privacy. Whether you choose to sit in the hot tub or relax by the fire in the great room, Cobb Vista offers something for everyone. The woodwork, radiant heated hardwood floors, and warm colors throughout this home offer a feeling of freshness, comfort, and rejuvenating vitality from the moment you walk in the door. Sit down, put your feet up, and take in the views — Cobb Vista is your sanctuary home away from home! 1. Upper level Evergreen Suite, King size bed, private bath with jacuzzi tub, en-suite wet bar. 3. Main level has a bedroom with twin bunk beds and a full bathroom in hall. Why Cobb Vista? What’s “Cobb” mean? Not what…but who. Russ Smith’s nickname was Cobb growing up, after the baseball player Ty Cobb. Russ Smith was a man with a huge heart, always a grin and a story to tell, and an infectious laugh that made him everyone’s immediate friend. He loved time in a mountain town and in 2000 he and his wife Scottie bought this house on Peak 7 as a retreat and gathering place for their family. After his death in 2002, we affectionately named the place “Cobb Vista” in memory of him and because, as the laughter and love of our family continues in this special place, we can almost hear dad saying, “will you look at that view!” We’re the Smith’s, son, daughters, and granddaughter of Russ. We invite you to come and share your own laughter, joy, adventures, and love with your friends and family in this retreat and gathering place … just as we often do! Cobb Vista is a place of warmth, welcome, and yes…a killer VIEW from every room! Come stay, relax, and enjoy! Breckenridge is not just a ski resort. It is an old mining town that celebrated 150 years in the summer of 2009. There are many activities in both winter and summer, including art fairs, concerts, film festival, the obvious outdoor activities and much more. Cobb Vista has lots of space to gather while still having lots of space for privacy. With additional apartment ($125/nt additional) can sleep up to 14, including children. toilet, shower, jetted tub, Located in Upper Level Master Suite. toilet, combination tub/shower, Hall Bathroom located on main floor. toilet, shower, jetted tub, Private bath located on main floor. toilet, combination tub/shower, Shared bath located on lower level. toilet, shower, Private bath located in attached apartment. Garage is attached to the house. New-installed November 2008 - Wood Provided. Large Great Room - excellent for gathering together. There are 3 dishwashers. Two in the main kitchen and one in the attached apartment. Both kitchens have a stove. Both kitchens have an oven. (3) There is 1 microwave in the main kitchen, 1 in the Master Suite wet bar, and 1 in the 2nd kitchen in the attached apartment. (2) Fully stocked kitchen on the Main Floor and 2nd fully stocked kitchen in the attached apartment (Indian Paintbrush Suite). Main Dining room can accommodate 10. Extra chairs and table available. (6) Cable TV High Definition. throughout house. 1 stereo located on main floor and 1 located in the apartment. Many Movies on VHS - VCR is located in the Indian Paintbrush Suite (1 bedroom apt attached to house). 1.3 Miles from Peak 7 Gondola. DVD Recorder, DVD Players, VCR/DVD Player, High Definition TV - 6 Flat LED or LCD HDTVs. Guest Pass to Gondola Lot Parking Lot. A nice, clean place to stay in Breckenridge. Overall, the home was a nice, clean, well-kept rental property, with all the amenities you would want in a vacation ski home. The heated driveway is an exceptional feature! Communication with the owner and property manager was convenient, easy, and unimposing. Andrea was a friendly and helpful! The master bathroom jacuzzi tub didn't work, but not enough of an issue to make it a 4 star experience. It's also possible I missed this somewhere in the messages back and forth. Overall, a good value for the price. Plenty of space, well stocked kitchen, and comfy furniture! If the opportunity arises, we will stay here again in a heartbeat! Beautiful house with well equipped kitchen. Our family had a great time at Cobb Vista. We never felt cramped and the views were breathtaking! The kitchen was well stocked and so easy to find everything. The beds were so comfortable! The property manager was super helpful and informative. We would definitely recommend the property to other people and use this property again if we are to return to Breckenridge! Beautiful home and grounds. Extremely clean and well furnished. Loved our stay in your beautiful home! Great for family... everything and more. Supplied with all the necessities just like home. Hope we get to enjoy again soon! Thank you Jane! We appreciate your family choosing our home for your gathering in Breckenridge and hope you will come back again soon! It was a pleasure having you all at the house! 50% of rental rate due at booking, remaining balance due 60 days out from arrival date. Rates shown are for Main House (6 bedrooms, 4 bathrooms). Optional Apartment Available for parties 14 - 16 for $125.00 per night, includes Queen bedroom, queen sofa sleeper, 3/4 bath, full kitchen and living room. Please note that if payments are made via Credit Card there is a 2% transaction fee that VRBO charges. Cobb Vista does not pass this cost on to our guests of this fee on the rental rates, however when your security deposit is returned if it is paid by credit card VRBO will deduct the transaction fee ($20) when your deposit is returned. If you make your payment (including security deposit) via eCheck Cobb Vista will return your deposit the same way and no transaction fee is incurred.